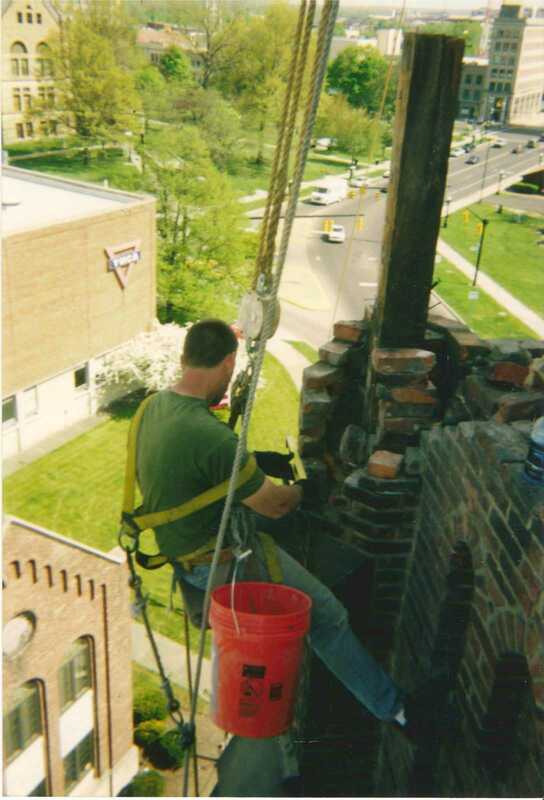 Looking for a steeple tower masonry contractor? 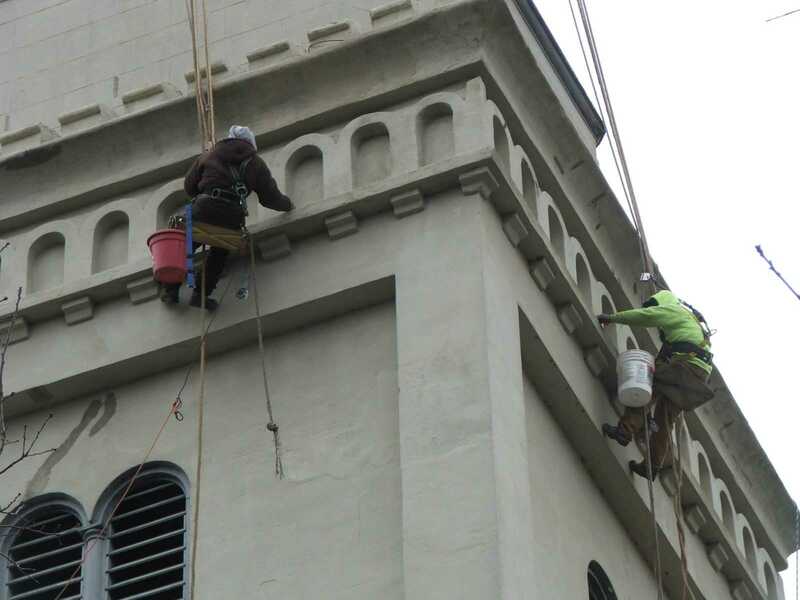 Tower and steeple masonry repairs can vary extensively from the regular maintenance of tuckpointing and cosmetic stone restoration to the more urgent structural repairs needed to save your steeple. Therefore, your steeple needs more than a typical stone mason, you need the craftsmanship of an experienced stone mason with the heart of an artist. 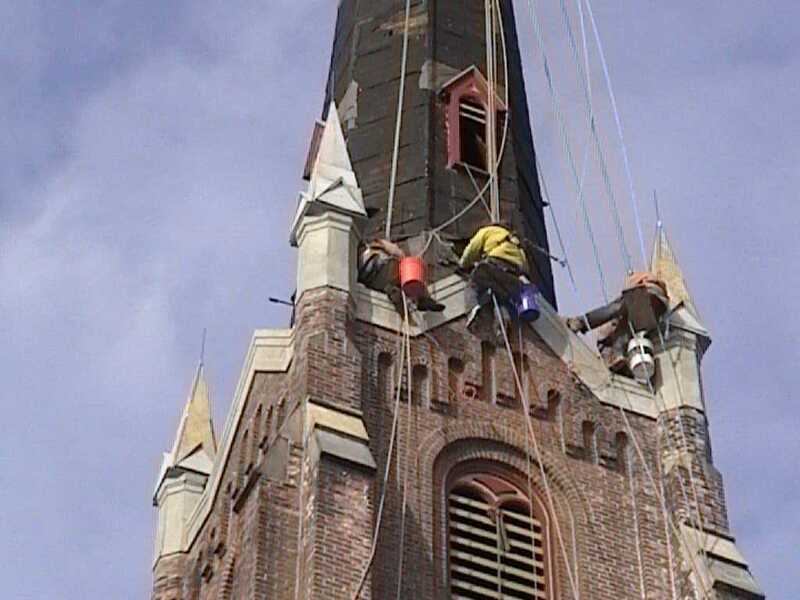 The steeplejacks of Inspired Heights are able to perform your church's high work tuck pointing, masonry repair, stone restoration and stucco repair without the high cost associated with modern approaches like cranes, lifts and scaffolding. 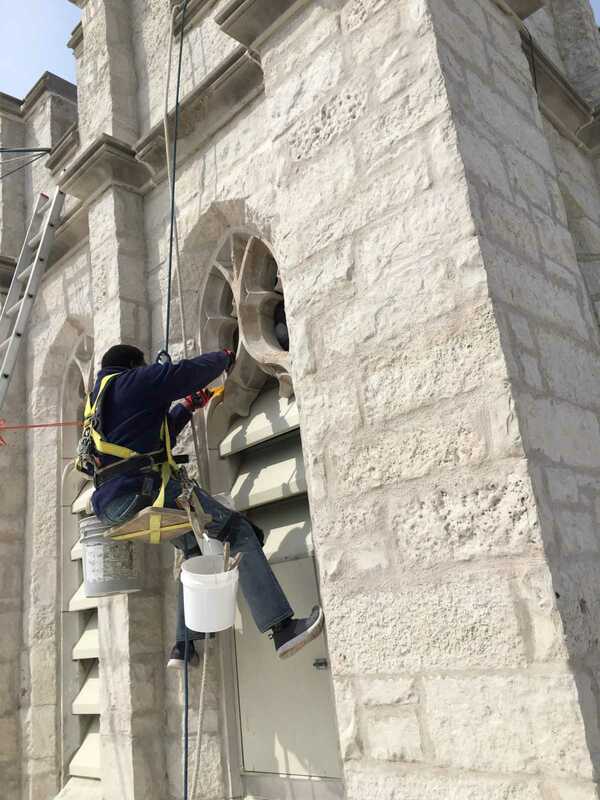 Giving a safe and affordable alternative in your church's masonry repair. However, the precarious location and heights are not the only challenges to a would be steeple and tower stone mason, they must be knowledgeable in historic mortars as well as modern cementitious products designed to restore the most damaged of stone and masonry. They need to understand the compatibility issues of newer, harder, cements and that of historic bricks and lime based mortars. They must be able to recognize the difference between a stress fracture and the warning signs that can prevent a steeple collapse. A properly maintained steeple or church tower can last for centuries yet shortcuts and inexperience can be devastating. Let our experienced steeplejacks help preserve your tower for future generations. Brick steeples and towers are vulnerable because the walls and parapets aren't securely tied to the floors and roof. On a poorly maintained or an unreinforced tower or brick steeple, parapets can break away, walls pull apart and the floors collapse. 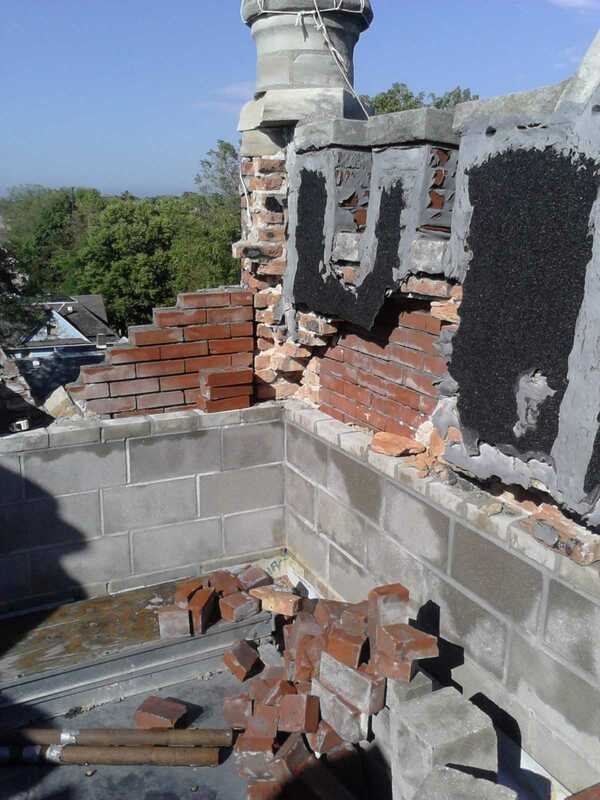 In addition to the integrity of the structure if they are not properly maintained there is a very serious danger from falling mortar and bricks, even a complete collapse. Therefore churches should schedule regular inspection and maintenance of their brick, stone and masonry towers by an experienced church steeple masonry contractor. While a properly maintained brick and stone steeple can last centuries weather and time can have devastating affects to the stone, mason and brick facades. In addition the freeze-thaw cycles of the seasons in the northern regions can expedite their breakdown, especially of the mortar joints. What Should Your Church Look For? Start by visually inspecting the brick joints. Look for signs of crumbling or missing mortar joints between the bricks. Then you'll want to probe with a small knife. If the mortar is loose, crumbling, or falls out easily, your steeple tower is in need of tuckpointing, repairs or restoration. Visually inspect the walls for spalling (flaking or crumbling of the brickwork). This form of deterioration usually results from water damage. The water may be entering from damaged mortar joints but if the mortar appears intact but the brickwork is spalling it may be evidence of an incompatibility between historic brick and an improper mortar mix. Efflorescence is a white powdery substance on the brick surface. Although unattractive, it's not harmful to brick masonry and can be easily removed. However, efflorescence is an indicator of excess water in the masonry, which can lead to more severe issues. Soft stones like sandstone, limestone and brownstone are commonly used on churches but may degrade over time. This can not only be unsightly but can cause for water penetration and further deterioration. If you think that your steeple tower needs repairs you should contact a masonry contractor for a site visit. Inspired Heights are steeplejacks that specialize in traditional tuckpointing materials and historic brick repairs. In addition to our familiarity with historic materials the masons of Inspired Heights stay current with stone restoration products that can repair the most deteriorated stone. For more information about historic mortars and bricks and how to properly care for them check out our church masonry page.